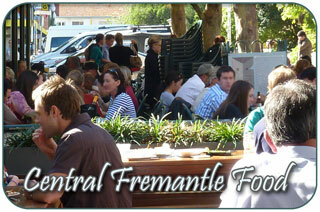 Central Fremantle offers a choice of food from all different cultures around the globe. Whatever your taste buds are in the mood for you can usually enjoy. 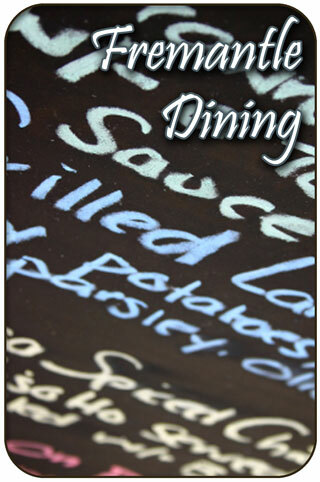 Food ranges from fine dining to fish and chips and everything in between. You can pick up food on the go from the many delicious bakeries and take-away food shops, there is such a variety in all locations. 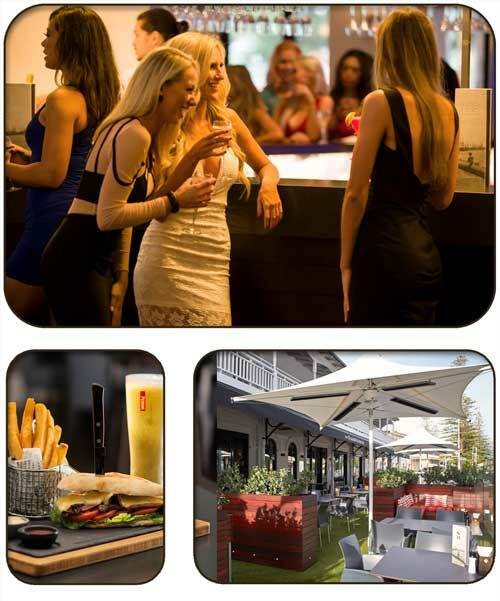 Dining on the Cappuccino Strip allows you to watch the world go by as you are enjoy your meal alfresco. 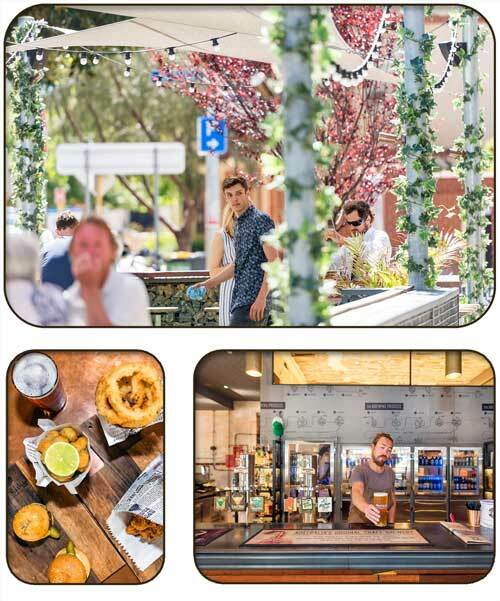 At the many Fremantle Markets there are many choices of food both inside and out. Fishing Boat Harbour and the Waterfront are also briming over with choice of culinary dishes for breakfast, lunch and dinner. As we say in Mexico Mi Casa es Su Casa - My House is your House. 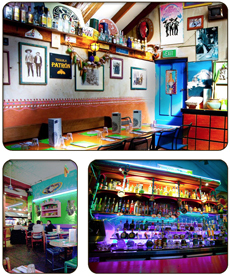 The Mex is a family friendly restaurant, serving up all your mexican favourites including our ever popular margaritas, delicious half-price tuesday nachos and extra especial fajitas! 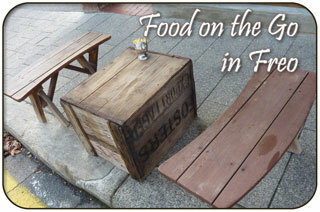 We offer alfresco dining in the streets of Fremantle and also a downstairs area for large bookings. Our famous cocktail bar houses a large assortment of 100 different varieties of authentic tequila, unavailable in other parts of town. We offer a relaxed and friendly atmosphere - The smile and service are guaranteed! What better way to get together, sharing a tapas plate and a margarita at The Mex! We offer a family friendly menu with something for the little amigos too! We offer a set banquet menu for groups of 8 or more people, which is great for work functions, hen's nights or Christmas parties. Open: DAILY for dinner from 5:30pm. Lunch from 12 noon weekends. Everyday is a feast at Atrium Garden Restaurant. 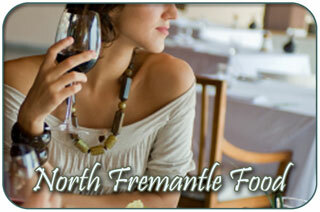 It’s all for you…at our Fremantle buffet restaurant. Enjoy fresh seafood, crisp salads, hot international dishes, Chef’s carvery and tempting desserts at our Fremantle buffet restaurant. The modern, spacious and family-friendly restaurant is perfect for your next celebration, especially for large groups that want to indulge in a variety of dishes that is great value for money. Adults and kids will be happy with $5 unlimited soft drinks and activity packs to keep the young ones busy while you enjoy your delicious meal. Try a fresh new approach to breakfast. RISE combines the best of contemporary hotel breakfast with the latest cafe offerings and a live Chef station. Join us throughout the year to indulge in a delicious buffet meal for special occasions or make your birthday, anniversary, family reunion, graduation dinner special by booking a table for you and your family! 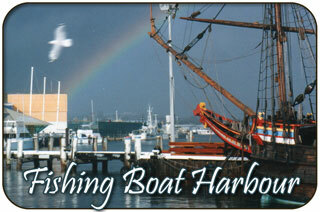 Experience a warm and relaxed atmosphere at The Harbour Master, located at the Esplanade Hotel Fremantle. 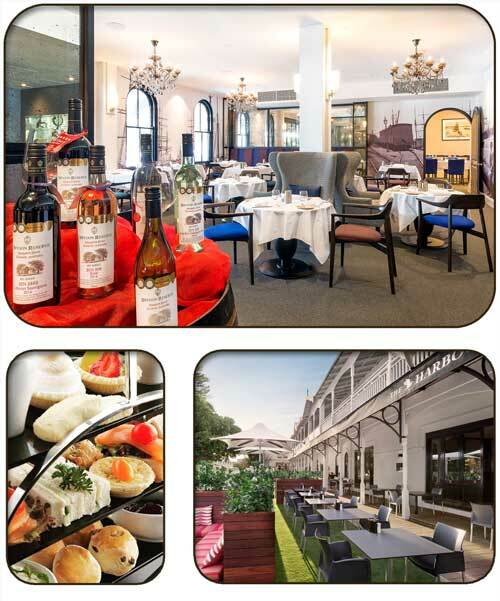 The restaurant design features historic images of Fremantle Harbour and surrounds to highlight the link between the development of the city and the evolution of the Hotel site. The contemporary dinner menu celebrates the best of local produce as well as new exciting share dishes. Enjoy a pre-dinner drink in the stylish cocktail bar, serving champagne by the glass, premium spirits and tempting cocktails. Enjoy the fresh air and beautiful park views at lunch and share some delicious food with friends while you sip on a cheeky local wine or beer. Try WA's Best Steak Sandwich seven days a week! The Harbour Master's private dining room is perfect for your next celebration with friends, family, colleagues or clients. This beautiful, intimate space seats up to 27 people. 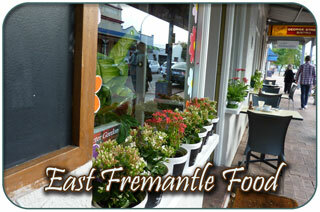 Here is a choice of some of the great places to eat in downtown Fremantle. 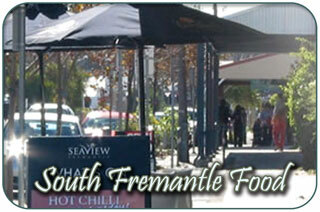 47 South Terrace (cnr Norfolk St) Fremantle. 4 - 6 Henderson Street, Fremantle. Rydges Esplanade Hotel, Marine Terrace, Fremantle. Shop 14 Piazza Arcade, 36 South Terrace. Fremantle. 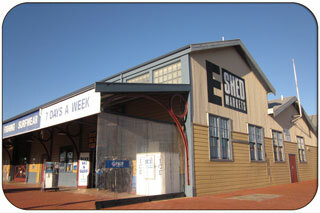 E-Shed, Victoria Quay Rd, Fremantle. Level 1, 14 South Terrace, Fremantle. 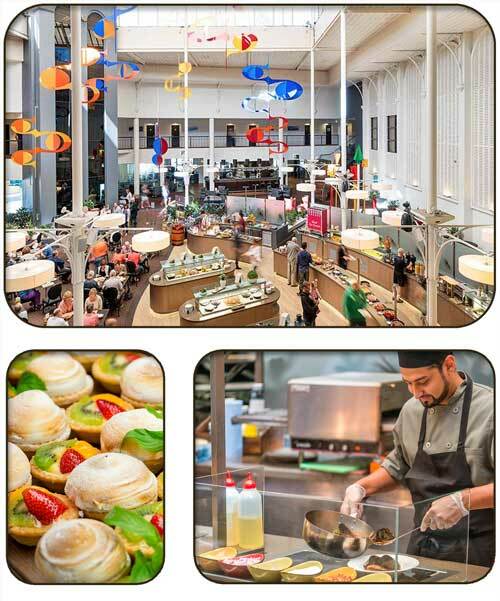 Within the Fremantle Markets there is a great choice of delicious and great value eateries all under the one roof! It's sure to suit the whole family. The Raw Kitchen, Bratwurst bar, Bodrum Kebabs, Cobz WA, Dosukoi Japanese Noddle & Bubble Tea, Fremantle Fish & Chips, Fremantle Markets Bar, Fremantle Markets Cafe, Freo Gozleme, Micheles Crepe Suzette, Saffron Bar, Srindia Spicy Food and Thai Vegetarian are all housed within the markets. Beside the Fremantle Markets there is an International Food Court serving a choice of around 15 different types of cuisine, all delicious! You can dine indoors or alfresco at tables intimately placed together. The atmosphere is particularly lively there on a Friday night which is late-nite shopping in Freo and at the Freo markets. It is a great place to meet groups of friends or family! 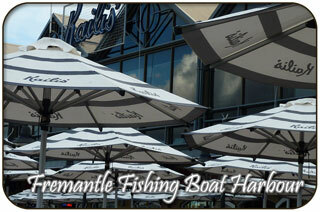 You can also dine at the E-Shed Markets in Victoria Quay, at the Fremantle Waterfront. The International Food Court offers a great variety of cuisine and you can enjoy both indoor dining and a picturesque alfresco alternative. Chinese, Kebabs, traditional Australian, Japanese, Indian, Juice Bar and Crepes are all on offer. Fishing Boat Harbour is a deep water harbour which has picturesque boardwalks, a lively atmosphere and plently of things to see and places to explore for people of all ages! There is always something happening on the wharf. There is also short stay accommodation, open ocean high-speed boat rides and luxury charter sailing tours available from the Fremantle Fishing Boat Harbour. Sometimes there are buskers or live outdoor entertainment captivating their audiences. View the statue of Bon Scott, the late lead singer of AC/DC. All the businesses who provide these services for you and create this friendly, lively yet relaxed atmosphere do so in the middle of a working Boat Harbour! The Fremantle Fisherman's monument is also located here. Cicerellos Fish’n’Chips, Kailis Fish Market Cafe, Little Creatures Brewery, SweetLips Fish and Chips,Joe's Fish Shack & Char Char Bull. 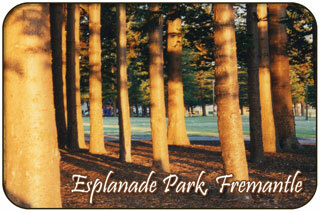 Esplanade Park is the perfect place to enjoy a picnic, a takeaway or a light snack from the Carriage Cafe. There are numerous cafes in the area and healthy take away food options to make up your own favourite lunch and picnic in style under the magnificant Norfolk Pine trees. Within the park there is a well equipped children’s playpark which sprawls over quite a large area with some unique playthings. Park benches and plenty of shade make this a great place to spend a few hours. The Carriage Cafe, is an old converted railway carriage where you can get delicious light meals and great coffee.